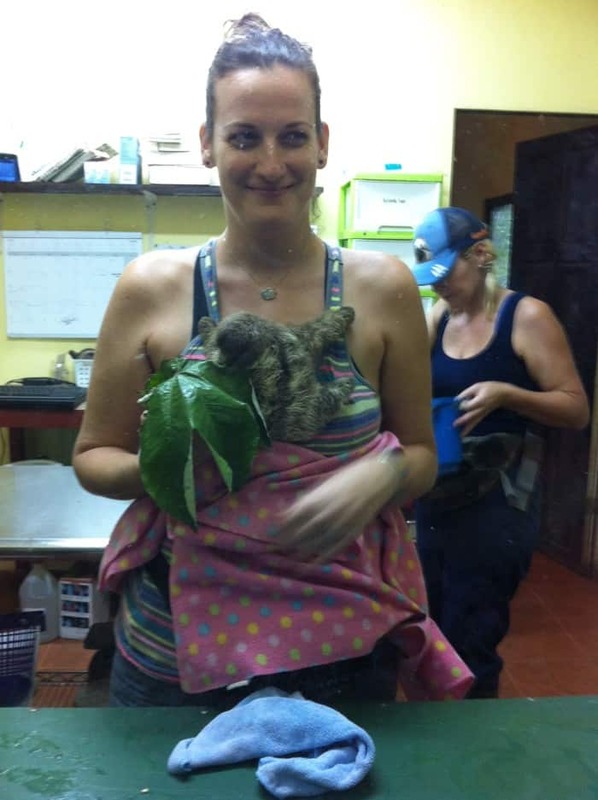 QUEPOS, Puntarenas — The three of us gasped in surprise when we saw the tiny three-toed baby sloth clinging to the chest of a human “Sloth Mama” named Sam. 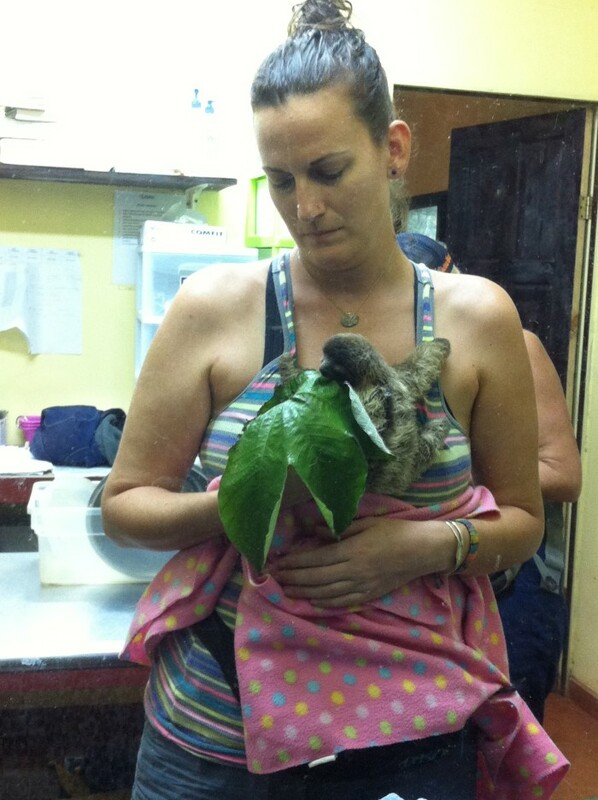 “His name is Chuck, and he was actually found in a tree without his mama,” said Vernita Gundy, 42, from Philadelphia, our tour guide at the Kids Saving the Rainforest animal rescue center near Manuel Antonio, where orphaned sloths are sadly abundant. Crying? What is the sound of a baby sloth crying? It was the kind of story that made full-grown humans want to cry. Yet Chuck was thriving — chewing on a big guarumo leaf, even as the three surprisingly large claws on his front paws clutched the bib of Sam Trull, 34, a U.S. primatologist who came to Costa Rica and accidentally fell in love with baby sloths. “There are five babies in the nursery, and then two sub-adults that are going to be released this summer that are outside,” Sam said, speaking into a microphone through a window that keeps the baby sloths safe from contagion and anxiety caused by anything outside (like us). “Chuck is 5 to 6 weeks old,” said Sam, holding her baby while a colleague behind her busily prepared food for all the other animals here. 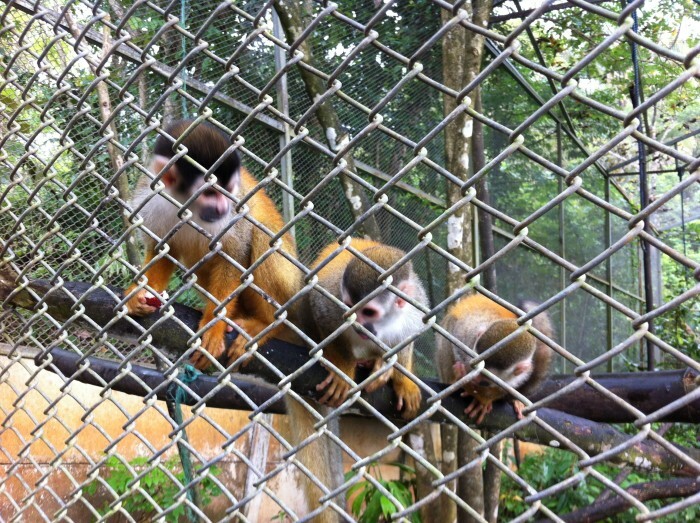 There are injured parrots, crippled hawks and a blind coatimundi. There are kinkajous and turtles. Ocelots and other felines could be an option for the future, but new cages would have to be built. The guarumo is not a dense tree, so it’s easier to spot a sloth feeding in one, she said. But after a good meal, the sloths move to trees with denser foliage, the better to protect them from aerial predators like harpy eagles. The sloths’ coarse fur makes a good host for green algae, the better to camouflage this docile pacifist in the treetops. Sloths would rather hide than fight — but if you want to fight one, you might want to make an appointment with the hospital first. Do they have sharp teeth? You don’t want to find out with your fingers. Sam was once badly bitten trying to feed a carrot to a two-toed sloth that had been electrocuted on a power line. Sam said this, bear in mind, with an infant three-toed sloth cuddling her chest, munching on a leaf. 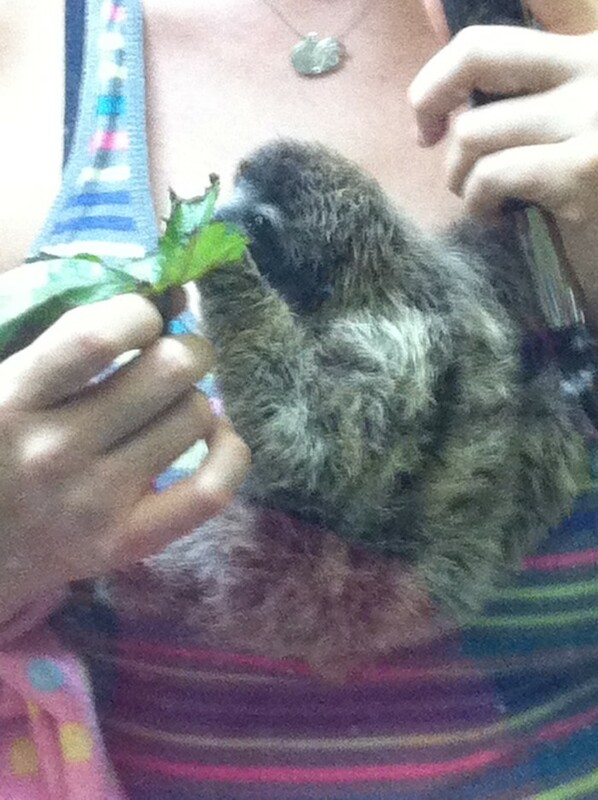 The three-toed sloths, on the other hand, have nubby molars that couldn’t do much damage. But sloths’ mouths are full of bacteria that can be really dangerous. “Almost everyone who is bitten by a sloth here has to take antibiotics because otherwise the bite can get infected really fast,” Sam said. 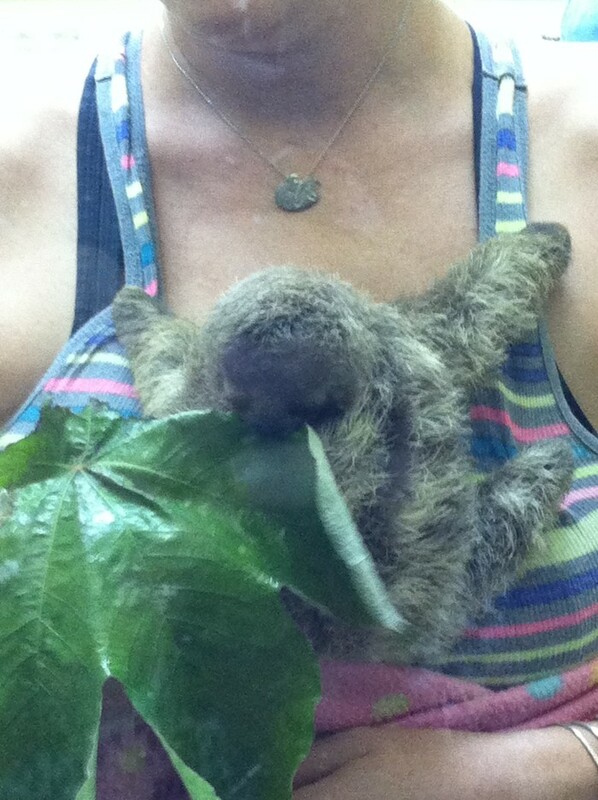 Little Chuck ignored us all and kept biting, biting, biting that tasty leaf, clinging to his Sloth Mama. And there was one thing Chuck wasn’t doing anymore.